It’s not an exaggeration to call Billie Holiday (Eleanora Fagan, 1915-59) the best of all jazz singers. Using her voice as an expressive musical instrument she bent notes like a horn player, blowing along with the cats. 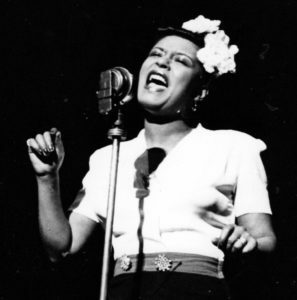 Building one of the most distinctive personal singing styles of Twentieth Century music, she revised songs for the better giving them her personal interpretation. 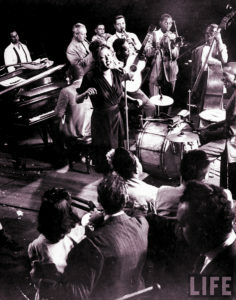 Her power to express a broad range of emotions was rarely equaled in American jazz or popular song. 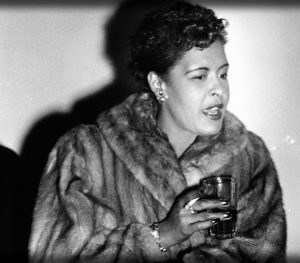 She revolutionized jazz and popular singing, influencing Frank Sinatra, Carmen McCrae, Etta Jones, Dinah Washington, Sarah Vaughn, Anita O’Day and others. 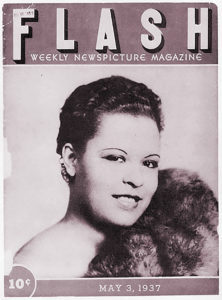 Billie sings in the “LIFE Magazine Goes to a Party” series, late-1930s. Though she evoked the feeling of the blues and made use of blues tonality, Holiday was primarily a jazz singer. But she sang very few blues lyrics, especially in the early years. Like the best singers, she often transformed and improved songs, many were forever reshaped by her interpretation. In the early days Billie would only sing wearing a Gardenia. Tomboy indeed. 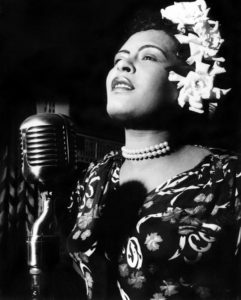 In contrast to her elegant voice and glamorous public image, Billie was quick to anger and could be downright threatening. Her language was salty and she swore like a sailor. Yet, she could be quite charming, modest and ladylike. Holiday did not like riding in trains — hated them — but loved flying. She loved soul food, beans and rice, greens, ham hocks and down-home cooking. And for instance when she toured England, Holiday carried a can of red beans in her suitcase to cook when she got tired of fancy hotel food. 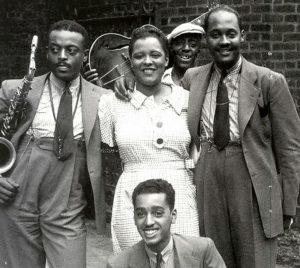 Besides tenor saxophonist Lester Young, musicians she admired first and foremost were Louis Armstrong and Bessie Smith. She was fond of piano player Teddy Wilson, tenor saxophonist Coleman Hawkins and Benny Goodman. Surprisingly, among the singers she mentioned favorably were Kay Starr and Peggy Lee. First Published image of Billie Holiday, 1937. Note that cosmetics and illumination were manipulated to lighten her skin tone.